Item Number: 199-03 17442 Actual Weight: 1.5 lbs. 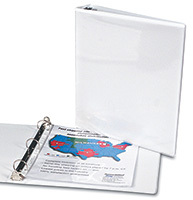 Vinyl binders have a clear pocket on the front, back, and spine to display labeling information. Binders have two interior pockets and round rings with concealed rivets.